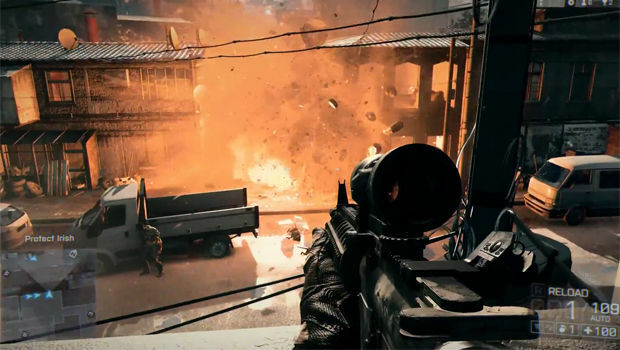 Can Battlefield 4's narrative be relevant after Spec Ops? In lieu of partying or whatever it is college kids are supposed to be doing, I decided that my number one priority this spring break would be to to replay Spec Ops: The Line. I joined the Spec Ops party a bit late, but the narrative really struck me in a way that few videogame stories have, and I have been slightly obsessed with it ever since. So, with Brendan Keogh's 50,000 word analysis Killing is Harmless by my side, I went through it again. And it's even more interesting the second time, with its critique of the player, videogames, and military shooters in particular. If you haven't done that, I highly recommend it. Ever since I first played Spec Ops, I've wondered whether or not it would influence future games and how it would do so. But since Spec Ops's release, there really haven't been any notable modern military games (Warfighter doesn't count). It turns out that Battlefield 4 will be the first. When I first saw that gameplay had been revealed, I was intrigued. When I read that DICE wanted "players to have a very emotional connection with the story and setting they're presenting," I was ecstatic. In my mind, this meant that the team had played Spec Ops, analyzed Spec Ops, and learned from Spec Ops. The game wouldn't be as soul-crushingly pessimistic (not a bad thing), but it would be a step ahead of the general military game narrative. So I went into the 17-minute long demo of Battlefield 4 excited, with Spec Ops's lessons fresh in my mind. Let me say that I appreciate that DICE is trying to do something with Battlefield 4. Battlefield 3 was a multiplayer game with a useless single player portion tacked on, but this new campaign seems like it has some real effort behind it. But I don't actually like what they're doing. If the team wants people to believe it is going for something emotional and believable, showcasing the protagonist sliding around a building as it collapses and then falling several stories (with a rock immediately overhead) and landing without serious injury probably isn't the right way to do that. The completely unbelievable amputation (one knife motion cuts through a hardened soldier's leg? seriously?) doesn't inspire me either, nor does the irritatingly manipulative death of that same character just a few minutes later. As with any criticism of pre-release footage (especially in this day and age), there is a problem of context. These 17 minutes are all shown without any greater narrative significance, so I can't rightly pass judgment on the emotional impact of the scene. It's totally possible that there are all kinds of amazing character moments that give some sort of weight to what is on display beforehand. I doubt it, but it's possible. Still, this is what EA and DICE decided was a representative slice of gameplay and narrative, and they decided to show off the single player before the multiplayer. It's a pretty gutsy move, so it's unlikely that they're showing anything less than their A-game. For that reason alone, I wouldn't feel bad making judgments, but what is on display here is also symptomatic of some larger issues that are very unlikely to change with context. Let's talk about cognitive dissonance. One of the more unique (and oppressive) features of Spec Ops: The Line was its use of loading screen tips. At the beginning of the game, they just say general things about the gameplay like any other game, but as things begin to unravel, the game starts talking to the player in a rather unpleasant way. Some of them are more direct ("Do you feel like a hero yet?") and some are more general ("Cognitive Dissonance is the unsettling feeling caused by holding two conflicting beliefs simultaneously. "), but they all make a point about the role of the player and of the player character. What makes them so significant, though, is that they don't just apply to Spec Ops. It is very likely that Battlefield 4 will make the player feel like a hero in the long run (although the gameplay demo does end on a sour note), but at any individual moment there is a question of what actual good is being done. This is especially true in a world ruled by DICE's Frostbite engine. Destructible environments are amazing things. Yes, I prefer Red Faction: Guerilla's real-time deformation to the model-swap that DICE prefers (especially since it doesn't lead to those awkward moments where blowing up a wall reveals an unharmed enemy immediately behind it who is firing on you while you reload your grenade launcher), but the gameplay possibilities afforded by either are really compelling. In Red Faction: Guerilla, it didn't really matter what you were destroying because you were playing a revolutionary/terrorist. You weren't a hero in the traditional sense. Now, what I'm saying applies to the last few Frostbite-run games DICE has released (and any other game with destructible environments), but it's not something I ever considered in a pre-Spec Ops world. Watch the gameplay video over again, and think about what happens at 4:49, when a grenade blows up a large section of a building. Yes, at this moment there were enemies in that building, ones who can now be more easily killed, but that is also a person's house. Then 10 seconds later the player blows up some cars, presumably owned by civilians. Why? Because it's an easier kill. Would that make you feel like a hero? It shouldn't. It should make you feel terrible and feel like your character is terrible. The apparent lack of civilians on the street means that it's easier to forget that the satellite dishes on top of each roof represent some virtual person who just wants to watch the news at night, but believing that you are doing good while wantonly destroying civilian property is the epitome of cognitive dissonance. 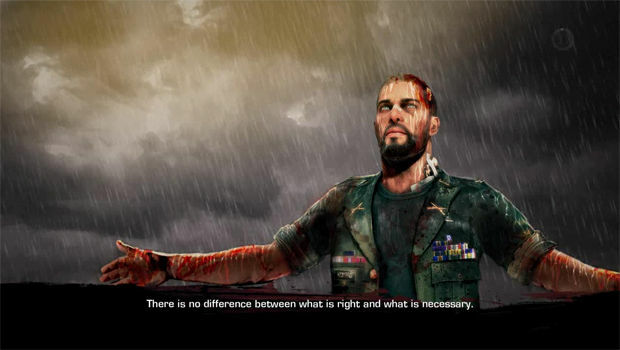 One of the other features that makes Spec Ops: The Line unique, and something that will likely find its way into other games as time goes on, is a progression of in-combat dialogue. At the beginning, characters shout "Tango down" after killing an enemy; by the end, it's "Got the fucker." At 7:46 in the Battlefield demo, somebody shouts, "Kill confirmed." It's a small thing, but it's significant. Rather than attempt to downplay the violence with their language, they are openly acknowledging what they are doing, and nobody has a problem with it. It brings to mind this particularly poignant Spec Ops loading screen: "To kill for yourself is murder. To kill for your government is heroic. To kill for entertainment is harmless." We go back to the idea of a hero. This confirmed kill is heroic, because it is done for the higher purpose of winning the war. For the player, though, it's harmless, because nobody is actually dying. It's very likely at least a few people were shouting that at me a couple of paragraphs ago. It doesn't matter if digital civilians are having their homes destroyed because they aren't real. There's no reason to feel any sort of dissonance. While some of that is true, it's also irrelevant. Another loading screen: "The US Military doesn't condone attacking unarmed combatants. But this isn't real so why should you care?" In Spec Ops: The Line and in Battlefield 4, the player should care because the game wants the player to care. They don't want the player to care about the same things, but both of them want to elicit some kind of emotional reaction. Selectively reacting to parts of the game is also a brilliant example of this kind of dissonance: "Oh, I feel bad about having caused the death of this virtual man I tried to save earlier, but I don't feel bad about killing all of these other virtual people or destroying the homes of these virtual civilians because they're not real or whatever." As soon as one death or event matters, then everything else matters as well. The fact that they didn't matter at the time says something about the way people connect with the medium, but it's also not the point. The character is an extension of the player, and the player must assume all responsibility for what that character does, good and bad. That is the lesson that Spec Ops taught. It is a lesson Battlefield 4 does not seem eager to expand upon. "So, Staff Sergent Dunn was KIA for... something we already knew?" "You have your orders, Captain." —because it could either prove or refute the point I just made. The issue is that second line and the role in plays in the greater narrative. The death of Staff Sergeant Dunn is not Captain Recker's fault (that scene could have just as easily played out with Dunn shooting the window himself); it's the fault of the people who gave those orders. So the player is absolved of blame, and now their anger (if they have any) is potentially shifted towards the people on the other end of the radio. That's interesting, but it also rings false. If the game plays with the idea of "orders" and their significance, then perhaps some of that responsibility will be shifted to the character, and then these ideas can be expanded further. That isn't to say I want every military shooter from here on out to be Spec Ops: The Line. I really don't. But a game now exists that has made generic military shooters narratively irrelevant.  In 2011, Battlefield 3's narrative was useless because of a clear lack of effort. But this time effort might not be enough. This won't affect sales, and it probably won't even affect review scores, but it will affect the game's lasting significance. 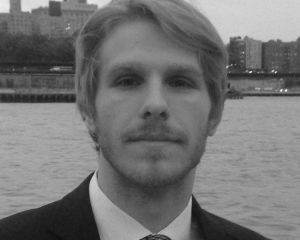 If Battlefield 4's campaign follows the same tropes that so many other military shooters have followed, the ones that it appears to be following despite the way they were so brilliantly deconstructed last year, then it will just be yet another campaign, distinguishable only by the number of birds that it has flying over a given map.